On this page you can view the results of the 2018 Bar Exam from the Supreme Court of the Philippines (SC). You may also utilize the comment section below for related discussions. Manila, Philippines – The November 2018 Bar Exam results and the full list of passers for the Philippine Lawyers' licensure exams including the topnotchers (top 20), among other important announcements will be available at this website as soon as the SC officially released the results 6 months (March to May 2019) after the last day of exams. The 2018 Bar Exams were administered by the Supreme Court (SC) headed by the its Chairman, Mariano del Castillo, Associate Justice and Office of the Bar Confidant headed by Deputy Clerk and Bar Confidant Atty. Ma. Cristina B. Layusa on four consecutive Sundays of the month, November 4, 11, 18 and 25, 2018 at University of Santo Tomas (UST). 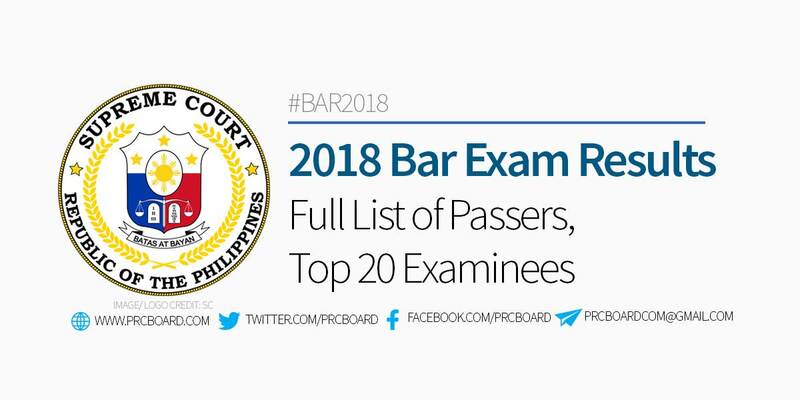 Shown below is the alphabetical list of passers as well as the top 20 examinees in the 2018 Bar Exams. The Supreme Court (SC) said that a total of 8,701 examinees were registered to take the 2018 Bar exams. In addition, 2018 Bar exam total takers is the highest in the previous years. In 2017, 6,750 examinees took the exams, 6,831 in the year 2016, 7,146 on 2015 and 6,344 on 2014. The November 2018 Bar exam is the 117th professional licensure exams held by the Supreme Court of the Philippines for all aspiring lawyers. "These questions, formulated by the bar examiners for each subject and selected personally by the bar committee Chair on the day of each examination, are formulated to test analytical ability, facility in expression in terms of written argument, comprehension of basic principles of law, and grasp of jurisprudence." "Due to the scope and difficulty, the bar examinations are regarded as the most prestigious professional licensure exam in the country. Bar exam is the only licensure examination not administered by the Professional Regulations Commission (PRC)." The oath-taking of the new lawyers candidates will be announced by SC after the posting of results. As referred to previous years' Bar exams, results are expected to be released by SC's Office of the Bar Confidant normally by the end of March up to May of the succeeding year. Update March 2019: Source said that results may be released on May 3, 2019 (Friday). The list of passers will be posted at Supreme Court official website and will be flashed via widescreen at Supreme Court's front yard. You may also refer to this article as we will also update the names of successful examinees once published by SC. Examinations for each year must be considered different from the previous Bar exams. Each bar examination must be considered unique in itself when we look at the comparative statistics across the years. Unlike other licensure examinations which employ a standard set of questions and the same set of examiners across a period of time, the bar examinations for each year is practically a new exam because the composition of the Committee differs from the Chair, who has absolute and sole discretion to choose the questions to be asked, to the eight examiners, who are the ones who correct the notebooks. So, when we look at a lower or higher percentage of passing for each year, it may be difficult to compare the two examinations as the questions are not the same, neither is the emphasis given by the Chair to particular topics; the appreciation of the answers, the point spread for each number during the checking by the examiners for each year will also differ. In the most recent Bar exams conducted on November 2017, 1,724 out of 6,750 (25.55%) examinees passed. During the November 2016 bar exams, 3,747 out of 6,344 aspiring lawyers passed or an overall passing rate of 59.06%, which according to SC is the highest in the last sixteen (16) years. On November 2015 exams, 1,731 out of the 6,605 examinees successfully passed or an overall passing rate of 26.21%. Rachel Angeli B. Miranda from University of the Philippines (UP) topped the exams garnering 87.40% rating. She was followed by Athena C. Plaza from University of San Carlos having 87.25%, Jayson C. Aguilar also from UP having 86.75%, Reginald M. Arceo and Mandy Therese Anderson from Ateneo de Manila University having 86.70% and 86.15% respective rating. To receive up-to-date news about November 2018 Bar Exam results, we advise our visitors to bookmark this page, visit SC official website or follow us at our social media pages via Facebook and Twitter.